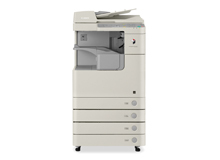 The imageRUNNER 2230 model is designed to make your documents look their best. These systems can capture images at true 600 x 600 dpi resolution and produce high-quality output for both text and images- equivalent to 1200 x 600 dpi for copying and 2400 x 600 dpi for printing, with 256 gradations. Each model hosts a number of productivity enhancing copy features that save time and money. Standard Automatic Duplexing provides two-sided printing to conserve time and paper. Also, with Canons RAPID Fusing System warm-up times and energy consumption costs are kept to a minimum. Copy originals up to 11" x 17"